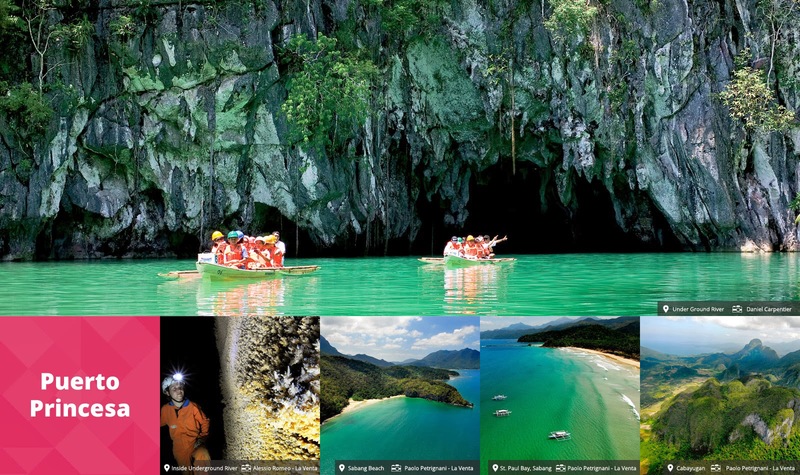 First and foremost, I'm writing this post as preparation to my series of blog post about our future Puerto Princesa, Palawan trip this coming Summer, which I will try to accomplish asap once our trip is done. This is because that future trip will be half the price and the story behind it will start with this entry. Because we received an invitation from Club Astoria for a marketing promotion a few months back. 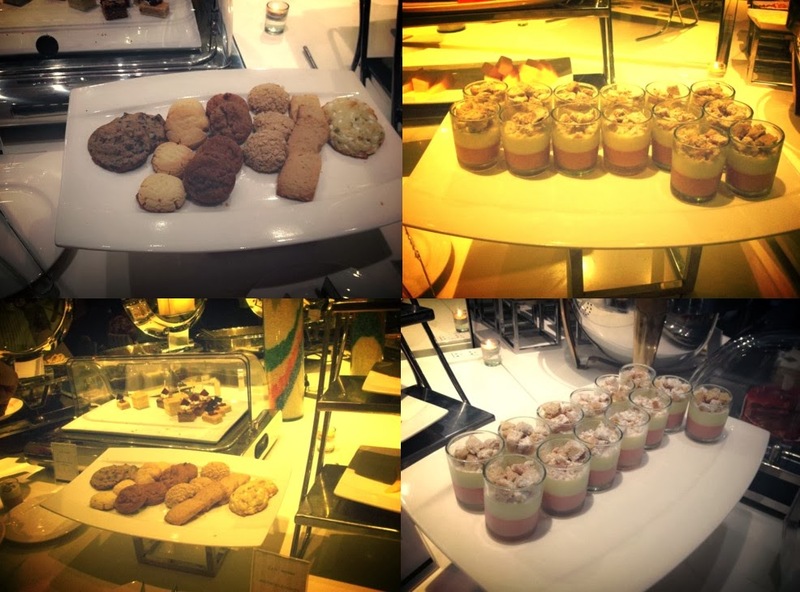 The message said that we will get to enjoy free lunch or dinner buffet and accommodation GCs and they need around 60-90 minutes of our time for a presentation and that there will be no obligation whatsoever if we are not interested with what they are offering. The message was pretty enticing, and we have nothing to do that one Saturday, so after a few exchanges of text messages we all happily obliged. Hey, who can say no to free buffet and accommodation GCs, may it be true or not. 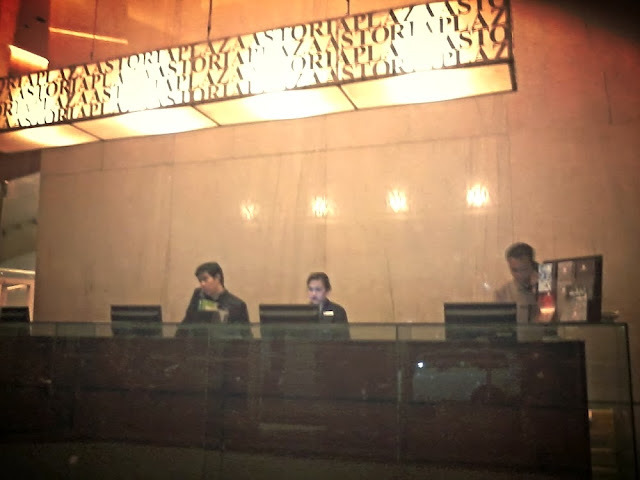 When we arrived we were directed to the Cafe Astoria, where we were greeted by a staff, asked for our names and valid IDs; after which, we were escorted to our table. There were lots of guests inside, Ijust don't know if they were there because of the same invite that we had. 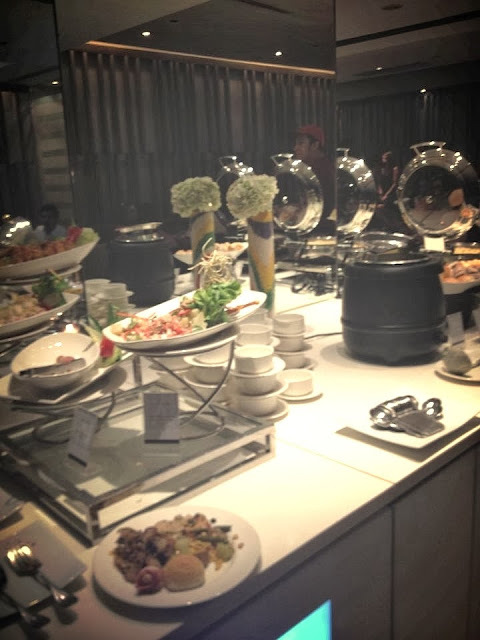 A Club Astoria sales agent went to our table and asked for some of our details and once she was done she told us to first enjoy the free buffet and after the dinner, the presentation will be rendered. 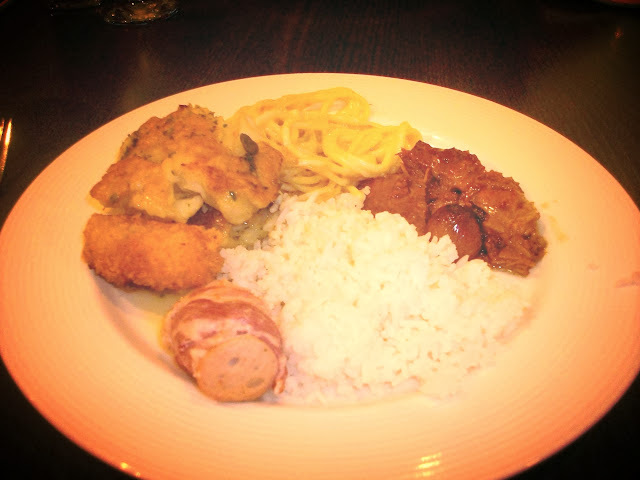 So we went to the part of Cafe Astoria where the food were set up and took portions of each. The food was ok, nothing spectacular. 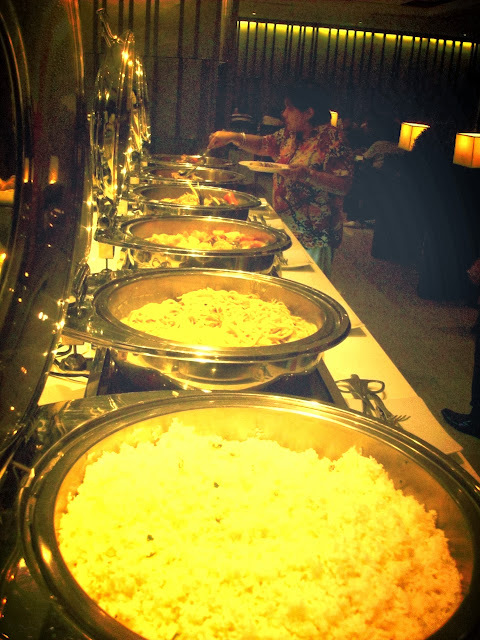 Well, I wasn't expecting too much since this is a free buffet, but everything was decent and nothing was bland. 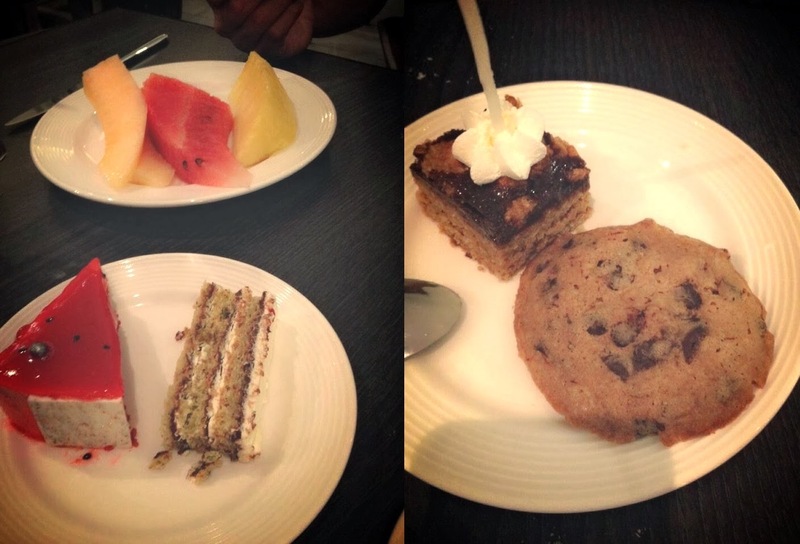 The selection was ample enough and I'm pretty much sure that chicken, beef, fish, pork and veggies were all present. I'm sorry but I was not able to take note of the names of the dishes. I like the fish dish, roast beef and the sausage wrapped in bacon, but didn't raved too much with the pasta. 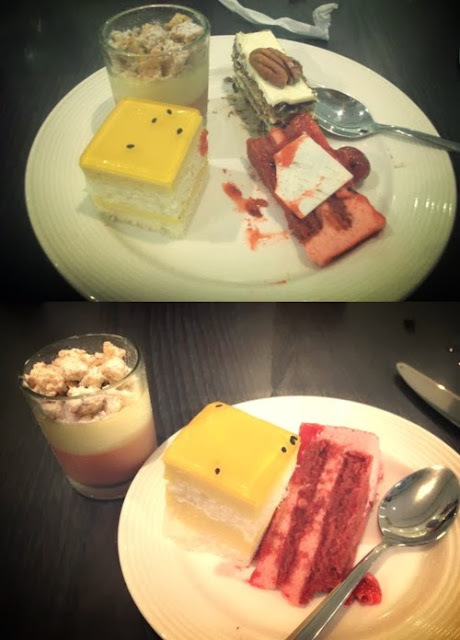 The desserts were the ones I loved! There was this Japanese Crepe that I wanted to try, but when I went back to get a portion after I was done with my dinner, an old lady was there getting hers, there were a few scoops left that can still feed two persons, but she was very impolite and greedy that she shoved every bit of the Japanese crepe onto her plate, but she knew very well that I was waiting for her to finish, no manners at all, tsk! tsk! I didn't get to taste it because we couldn't wait for the refill anymore for the presentation was about to start. 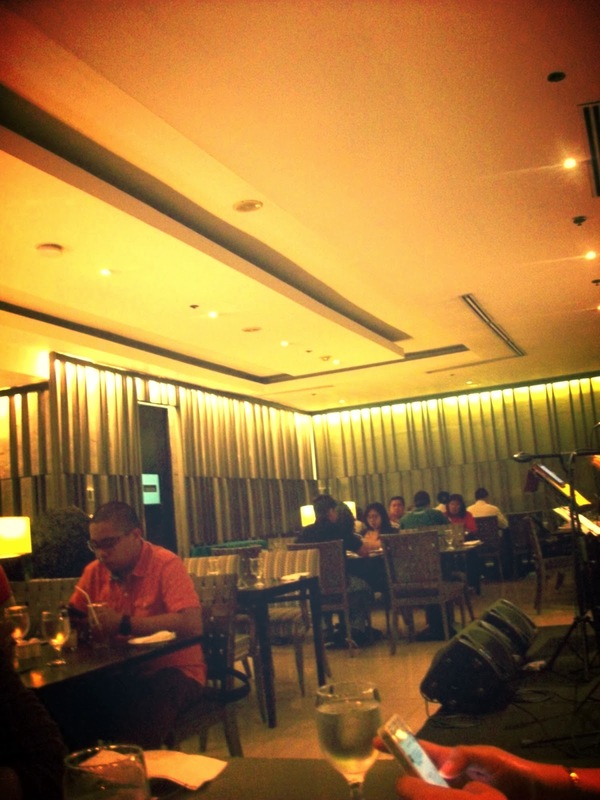 The cafe has a cozy ambiance, with just enough lighting to set the mood. And the posh interior design makes it hard to miss that you're in an Club Astoria establishment; they pretty much incorporate the same design concepts in all their ventures. See my blog post about Astoria Boracay here. 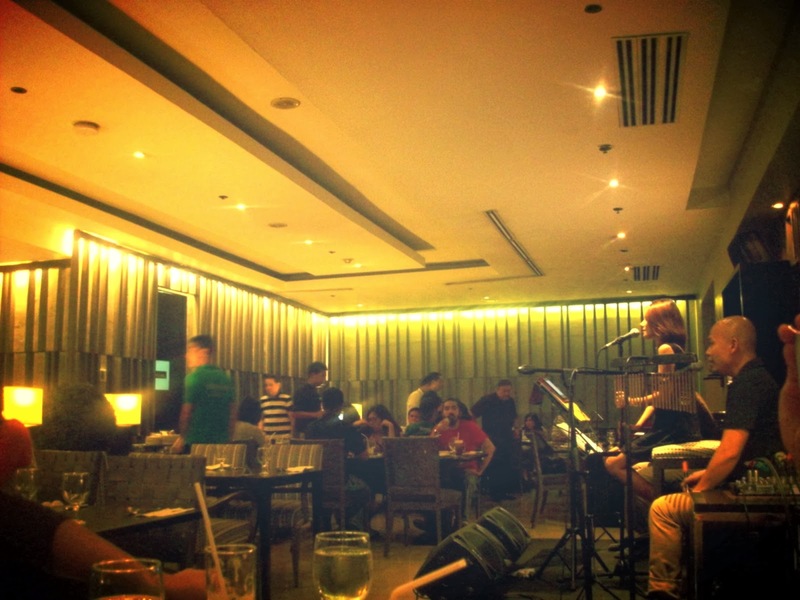 You also get to be serenaded by an acoustic band while you chow down your food. After the dinner we were escorted by one of the sales agent to the penthouse floor where the presentation was held. We were assigned to a male sales agent, I forgot his name though, he was very enthusiastic and jolly. 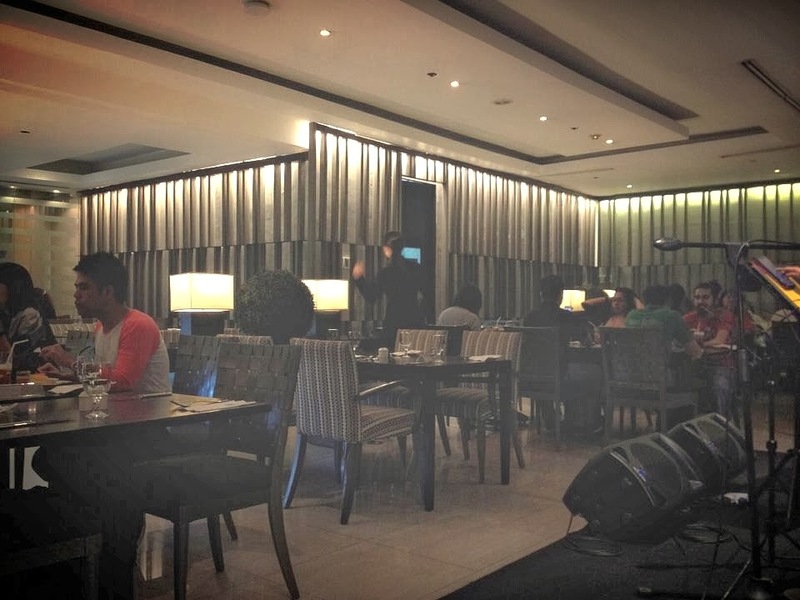 He explained to us in great detail what they were offering and even toured us in one of the units at Astoria Plaza, which we are pretty much familiar on how it looks like because a friend of ours held her birthday there a few years ago. 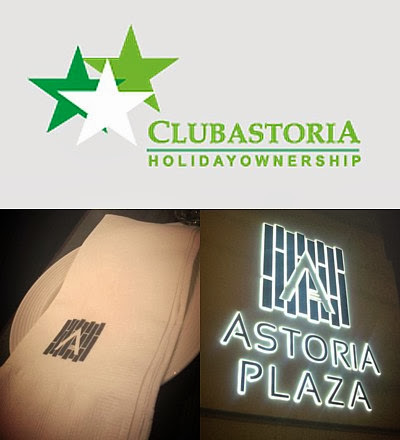 Club Astoria Holiday Ownership was launched on February of 2006, Club Astoria has since become the leading timeshare company in the Philippines, with the most number of members and the largest sales and marketing operations. Club Astoria offers holiday vacation ownership shares, allowing each member access to explore new destinations and view exotic cultures. 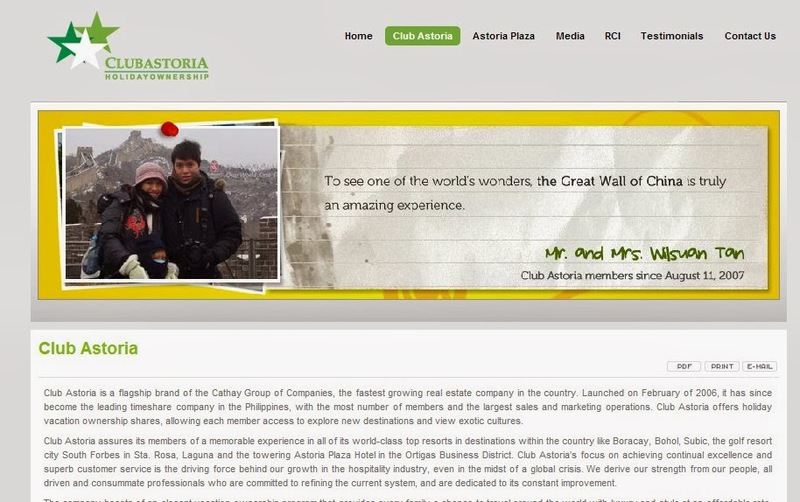 Club Astoria assures its members of a memorable experience in all of its world-class top resorts in destinations within the country like Boracay, Bohol, Subic, the golf resort city South Forbes in Sta. Rosa, Laguna and the towering Astoria Plaza Hotel in the Ortigas Business District. The company boasts of an elegant vacation ownership program that provides every family a chance to travel around the world with luxury and style at an affordable rate. Club Astoria is a proud affiliate of RCI (Resorts Condominiums International) that has over 3800 affiliate hotels and resorts around the globe. For four consecutive years (2006 to 2009), Astoria Plaza has earned the much-coveted Gold Crown Award, RCI's top resort or hotel category for excellent service and amenities. The results are based on the comment cards submitted by RCI Exchange Guests from other hotels and resorts and therefore each client is assured that Astoria Plaza meets the highest global standards. Because of our prestigious status, members are given preferential treatment in terms of booking schedule and selection of hotels and resorts; each Club Astoria member enjoys the highest trading power of week entitlement that accommodates for very flexible travel scheduling. It was a pretty nice offer with all the perks and money-saving that goes with it; we were already into it, but when the price was revealed, we immediately back off. Honestly, we wanted something like it, even if we already have other bills to attend to, we could have probably squeezed it in our budget if the price was reasonable enough for a newly-married couple who is just starting a family. The sales agent even offered us their lowest priced membership using coupons but these are valid only for a couple of months and we don't think we can travel that frequently in that span of time, given that it's really hard for us to take some time off from work. Plus the promo is only good for that night, not only that it leaves you unprepared, it also won't give you enough time to decide carefully; it will be a very impulse buy to give in to, which is not very practical. This is only applicable for expats, retirees who don't know where to spend their extra money on, filthy rich people, and/or very frequent travelers. When the sales agent realized that he's not going to sell, he politely ended the presentation, thanked us for our time and told us that he will just get the accommodation GCs that were promised to us. I feel sad for him because he didn't make a sale with us, and I also felt bad, because I felt we let him down. If only we had that tons of money to spend, we wouldn't have think twice. A few minutes later, the sales agent came back with the accommodation GC. 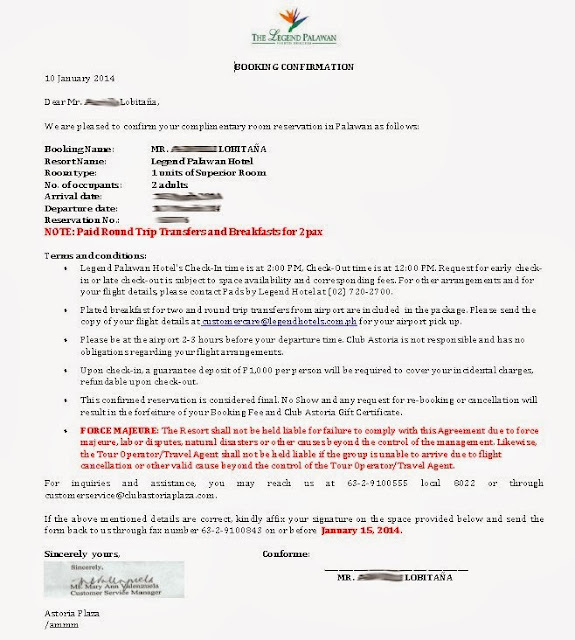 It stated there Club Astoria is giving us a complimentary accommodation for two to their tie-up hotels. If you can read the destinations below, no we are not to use it in some or all of those places, we just need to pick one. We got excited about this right away, so a few days later I researched online to see the feedback if this gift certificate is for real. Unfortunately, I found two or three reviews that stated that they were successful in redeeming or using the GC. I even messaged someone who was able to book it on their trip to Bangkok, and she replied saying that it was totally a hassle before they were able to use it. Bottom-line is almost everything that I read online about this complimentary accommodation was discouraging. After that we didn't bother to avail of the GC anymore. Not until our last Boracay trip that we received free flights to any destinations in the Philippines (because of our very delayed flight back to Manila, read related blog posts about it here and here) that the idea to use the GC was brought up again. We booked the free flight at PAL's ticketing office and the following day, they were approved. So I prayed, and I prayed hard for it that this time around and in our case we can avail of the Club Astoria GC without any hassle at all. 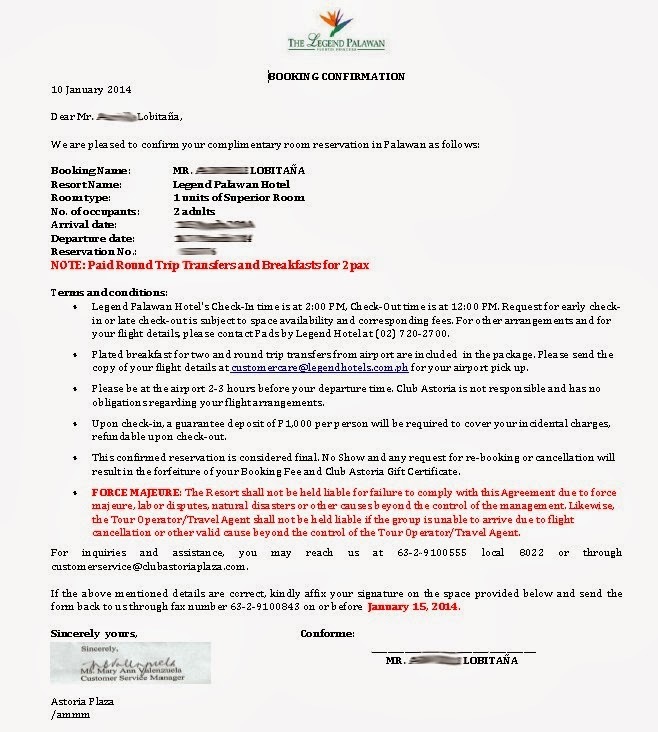 I inquired about it through Club Astoria's Customer Service and after a few exchanges of email and settling of the refundable fee, we received our hotel booking confirmation at The Legend Hotel Palawan in Puerto Prinsesa, and it all happened in less than two weeks! You can't imagine how happy we were of that answered prayer! So maybe, we are one of the very few people who will be able to avail of the accommodation gift certificate. I think this happened without any roadblocks probably because we believed in it and we were not so skeptic about it, I suddenly remember the line from Happy Feet 2 when Eric said "If you want it, you must will it. If you will it, it will be yours." because of these circumstances. We originally had no plans of travelling because we're saving up for the baby we're planning to have this year, but because of the series of fortunate events that transpired these past couple of months and with God's blessing, we will still get to travel this year! Yey! You have a circle of people who love and treatment for you. It is a card of loss of life and rebirth, merely put, the death of the old and the birth of the new. Now is the time to be more honest with a sweetheart. Hey I'm just curious. Were you able to get the 5K pesos refund for the Astoria GC? I was able to refund the 5k, you just have to constantly follow up with them. My 2014 Make Up and Beauty Tools Wishlist!